P.S. The sighting of five butterflies this year refers to particular regions where monarchs are typically expected – “in regions where more than 100 monarchs were spotted in the province last year, fewer than five have been observed this year.” For more on this, please visit Vidya Kauri’s recent piece in G&M. 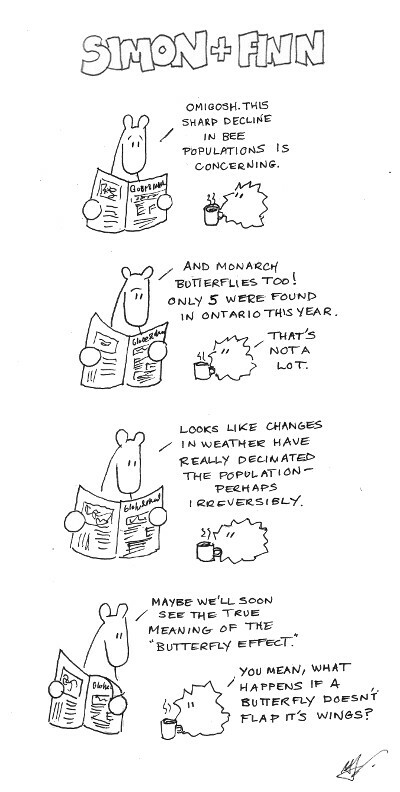 This entry was posted in S&F Cartoons only, Sciency stuff and tagged colony collapse disorder, monarch butterfly decline, monarch population Ontario, philosophy webcomic, simon and finn, simon and finn webcomic, Vidya Kauri by simonandfinn. Bookmark the permalink. This is sad news indeed. When I was in Edmonton I saw this beautiful documentary in IMAX 3D. I highly recommend it. Yes exactly… the sound of no wings flapping..
Hm, good question. I think the butterfly effect of this situation is currently chrysalid in nature.